Fantasy football is usually never won with the team you drafted. Injuries, suspensions, and poor play can often leave your team decimated and lackluster. As unfortunate as injuries and poor play can be, it also brings out potential fantasy lottery tickets. Lottery tickets like David Johnson and Jordan Howard can be the difference makers that lead you to a fantasy football championship. Week 1 was plagued by injuries, but that makes this first waiver wire period even more exciting and important. Here are some guys to look at for Week 2 waiver wire gems, with their respective ownership in Yahoo. Kevin White wasn’t the only significant injury for the Bears on Sunday. RB Benny Cunningham, who was the receiving back for Chicago, left Week 1 with an ankle injury. There had been some hype for rookie running back Tarik Cohen, who was being drafted in the 14th round according to fantasyfootballcalculator.com. That hype has grown stronger after Cohen went off yesterday. Cohen ran 5 times for 66 yards and added 8 receptions for 47 yards and a touchdown. 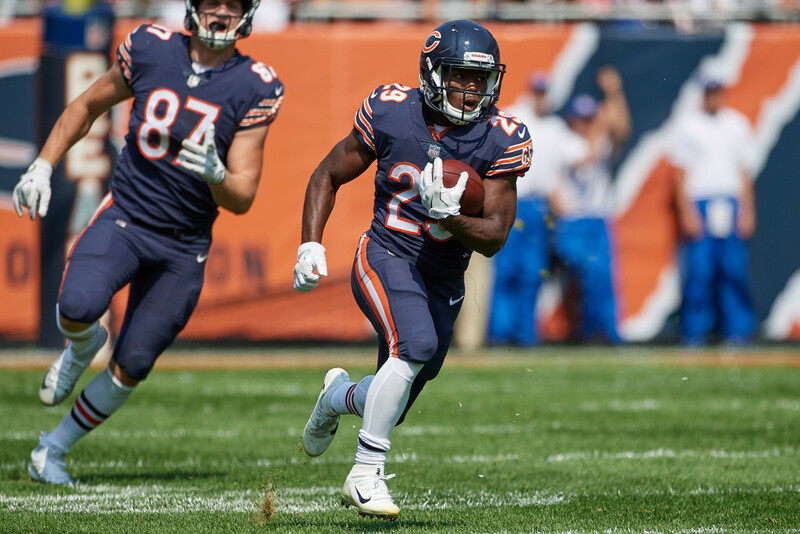 He had 13 touches to Jordan Howard’s 16, and Howard looked only okay in yesterday’s game, dropping a game winning touchdown late in the 4th quarter. Cohen may have earned a 50% share in this backfield, is a must add in 10 team leagues, especially in PPR leagues. Fantasy owners were scared last year after David Johnson went down with a gross looking knee injury. A month later, he was jumping out of a pool without using his hands. Ironically enough, a dislocated wrist could keep Johnson out for 2-3 months. Nobody likes a committee, but it appears as though Arizona will form one with Kerwynn Williams, Andre Ellington, and a newly signed DJ Foster. Ellington out-snapped Williams once Johnson left, but seemed to be more of the blocking/receiving downs running back. Ellington caught 2 of 3 targets for 35 yards but did not carry the football. Williams, on the other hand, had 5 carries for 10 yards and 1 td, and added 1 catch for 2 yards. These two will be hot waiver wire pickups, but probably won’t be the “lottery tickets” as mentioned before. Kerwynn should be picked up in all leagues and Ellington in deeper leagues (14 team), but don’t expect them to come close to DJs scoring. This backfield just became a nightmare to own. Kenny Golladay was another rookie who gained a lot of hype this preseason, having an ADP of 13.01 in 12-team standard leagues. Matt Stafford isn’t afraid to air it out, as was evident in his 41 pass attempts. Seven of those went to the rookie, and he turned those into 4 catches for 69 yards and 2 touchdowns, one of which was a highlight reel 45 yard diving catch. Golladay is an interesting waiver wire addition, and should be added in 12 team leagues. Golden Tate still seems to have a stranglehold as the top targeted receiver, but Golladay should start seeing even more looks in this high passing offense. Allen Hurns wasn’t even drafted this year in most fantasy leagues thanks to an abysmal 2016 season. Yet only 2 seasons ago Hurns caught 64 passes for 1031 yards and 10 touchdowns. The Jacksonville Jaguars may want to be more of a run first offense, but with the loss of #1 WR Allen Robinson to an ACL tear, Hurns may be thrust into the spotlight once again. In yesterday’s game, Hurns caught 3 of 4 targets for 42 yards. This looks a little disappointing for a potential waiver wire gem, but Jacksonville led this game and therefore managed the clock with rushing. This won’t always be the case, and Blake Bortles will eventually have to throw. Bortles has a rapport with Hurns, and in games where Jacksonville is behind, “garbage time” Blake Bortles will be throwing. Hurns should be added in 12 team leagues. Buck Allen actually out-snapped Terrance West in Week 1, and with a potential tear in Danny Woodhead’s hamstring, Allen could have a significant role in Baltimore. Allen rushed 21 times for 71 yards against Cincinnati. QB Joe Flacco loves to throw to his running backs, so Allen may be in line for some targets. It is unsure if Allen will have the Danny Woodhead role, but he is worth picking up in deeper leagues, and has potential 10-12 team leagues if news comes out that Allen will be the predominant pass catching back. Kendall Wright has been discussed as a potential flier this preseason, and with a devastating injury to WR Kevin White, becomes a must add in deeper leagues. Wright caught 3 of 4 targets yesterday for 34 yards. Just like Hurns this may seem like a boring waiver wire add, but opportunity trumps talent in fantasy football sometimes. Wright is now the top WR in Chicago, and with the Bears probably playing from behind this season, look for him to get plenty of targets this season. Let’s see if this former round 1 draft pick can live up to his draft position. Wright should be added in 14 team leagues, more so in PPR leagues. Chris Carson looked way better than Eddie Lacy (5 carries for 3 yards) yesterday, rushing for 39 yards on 6 carries and adding 1 reception for 10 yards. He seemed to make something out of nothing, which is needed thanks to Seattle’s awful offensive line. With Thomas Rawls constantly injured and Lacy looking slow, Carson could quickly push his way into more carries. CJ Prosise will still handle receiving downs, but Carson can be stashed in deeper (14 team) leagues as a potential lottery ticket. If Rawls goes down again or plays poorly, Carson could be the lead back sometime this season.